CBSE (Central Board of Secondary Education) Patrachar soon will issue application form 2018-19 sessions for those students who had failed/pass in 8th and 9th class and 11th class. This is best options for those students who had not extend their studies properly due to reasons so that’s the good opportunity for that students who had drop out their years in 8th, 9th and 11th class. Its time see apply as soon as possible for the admission in the CBSE Patrachar exam because last date it near. All details related to the CBSE Patrachar is here you just have to follow us so that all the details related to it can be get from it. Follow the given below steps so that last date, online form can be downloaded easily and in much better way. Students are advised to get set ready for CBSE Patrachar admission 2018 because online forms are out!! Good News is that eligible students can start filling online form for CBSE Patrachar admission form 2018. One thing you should need to clear this that please stay in inform with CBSE Patrachar admission 2018 last date. Patrachar Vidyalaya Delhi admission form are out now you just have to come and apply for the admission according to updates. Large numbers of students remain un applied online form for Patrachar vidyalaya Delhi admission after last date of applying online form goes out. So fast up students and applied online form for CBSE Patrachar admission 2018. We suggest you to stay in touch of us so that all the updates related to the admit card, result, syllabus, roll no can be get to you easily. 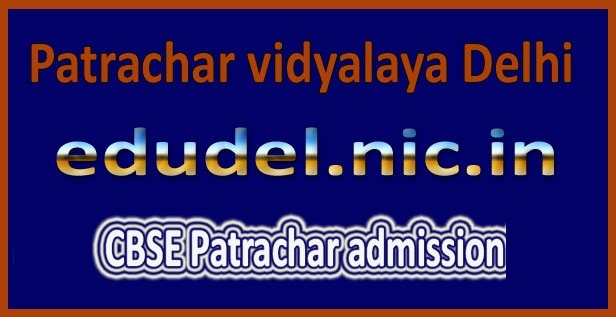 Patrachar Vidyalaya gives offer to those students who want to do 10th and 12th class by CBSE Board. So students are ready to filing application form of Patrachar Vidyalaya. Every year lots of students take admission in Patrachar Vidyalaya and completed their studies according to their education criteria. Patrachar Vidyalaya provides good education quality to every student who are pursuing in Patrachar Vidyalaya. Students must be pas/failed in 8th and 9th class or dropout students. Girls can get direct admission in 10th class. Students must have SLC/TC of last school attendant. They should have to mark statement or Address proof of Delhi. Students who have studies out of Delhi then they need to migration certificate to get admission in 10th class or girls can get direct admission through affidavit only. Students those are studies out of Delhi then they need to migration certificate to get admission in 11th class or students must have attached 10th class document of recognized board/university or institute. Students those who carrying TC/ SLC of Last School attended and having Mark statement or Address Proof of Delhi. Patrachar Vidyalaya was established in 1999 and its work for students who drop out from their schools due some reason. Patrachar School specially works for girl’s who extually economically weak are and for those who had not completed their education because of their personal reasons. Its main aim is to do help and guide for those students who don’t get proper education by other source of education field. CBSE Patrachar Vidyalaya teaches to students in Hindi, English and Punjabi medium. Patrachar vidyalaya Delhi provides morning and evening batches class which is very important for students. Patrachar is also provided facility of weekend batches for those students who are not strong by financially and can’t be submit their fees of class of Patrachar. For more details Students regarding procedure of form filling, examination form, assignment information, eligibility, other important dates for filling forms, Regular/Weekend classes through website of CBSE Patrachar Vidyalaya. We hereby advice to all the CBSE Patrachar applicant that they should come and apply for the exam so that they can’t able loose the chance to take admission. Also stay connected with us to get more news and updates related to result, exam and more easily. Patrachar is also taken parents meeting, daily attendance, proper school uniform, sports activities, half yearly exams etc of students. Those are study in Patrachar Vidyalaya and there are also some special classes for girls students like personality development classes and computer education. Patrachar exam admission is taken with total care and precautions so it is necessary for the students to apply with total care by reading all the documents. So students are waiting for starting of Patrachar Vidyalaya application form 2018 and this is best option to complete their studies for those students who are weak by financial crises, they can do their part time job side by side and can complete their education. Then now a good news is coming from officials that you might be able to start filling online form for CBSE Patrachar admission 2018 as follow up link mentioned down below on this page for applying online form. As per latest updated made Online application forms are going to out soon at official web Page of Mentioned link as above, So students are advised that be ready to check out exam date sheet and fill online form. Get exact latest info regarding CBSE Patrachar admission 2018, CBSE Patrachar admission 2018 last date available here on Postalert Portal by staying in touch with us on our social Media Pages. Keep in touch with the postalert.in website portal so that future updates can be given to you from time to time.